Built in 2012, the deluxe yacht-like MV President flaunts sleek lines and state-of-the-art equipment and amenities for optimal guest comfort and safety. 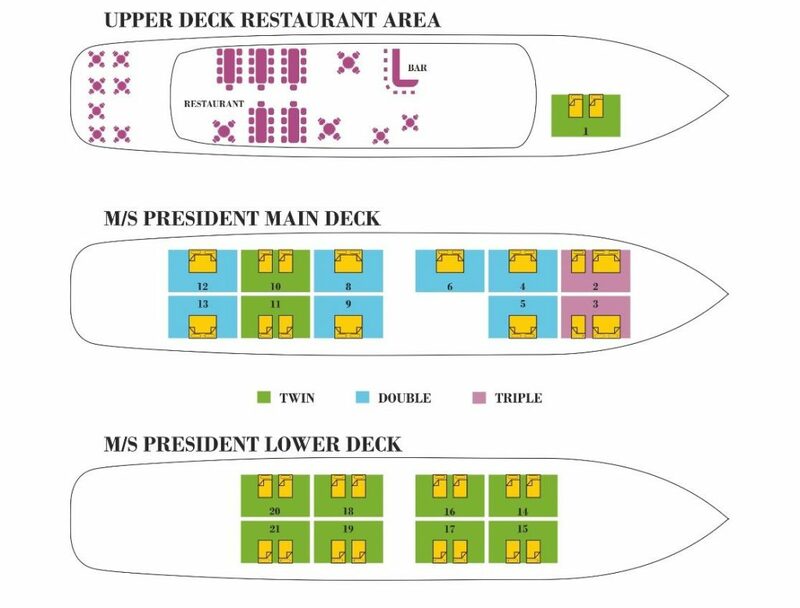 Located over two decks, the 21 spacious, air-conditioned double/twin cabins provide flexible bedding configurations for up to 40 guests. During the day, life on the ship tends to centre around the expansive sun deck that boasts a shady canopied area, sun loungers and a plunge pool. Daily buffet breakfast and half-board meals are served in the airy, modern salon-restaurant. There is also a bar and an outdoor terrace with tables and chairs. Launched in 2012, the 47 m MV President is a modern yacht-like vessel that features state-of-the-art equipment and an excellent range of first-class amenities. The 21 air-conditioned cabins are located over the upper, main and lower decks, each featuring an en suite bathroom and standard double or twin beds. Public areas of the ship are spacious and elegantly furnished. Guests can enjoy refreshments in the chic salon-restaurant whilst admiring the spectacular views from the large panoramic windows. The outdoor terrace, bar and partially shaded sun deck are equally inviting communal spaces. To the rear of the ship there is a swimming platform with ladder access. 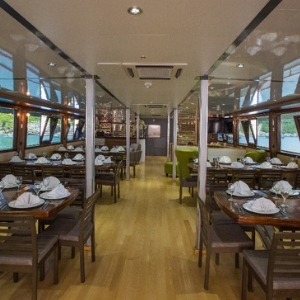 Located on the upper, main and lower decks, the 21 air-conditioned cabins offer a comfortable space to relax, for up to 40 guests. 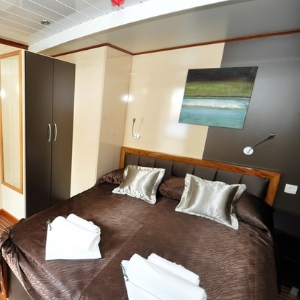 All cabins feature double or twin beds, a private en suite bathroom with shower, flat-screen LCD TV, wardrobe, desk, in-room safe, hairdryer and a selection of complementary toiletries. The décor is modern and includes a neutral tone palette of colours, and stylish fabrics. 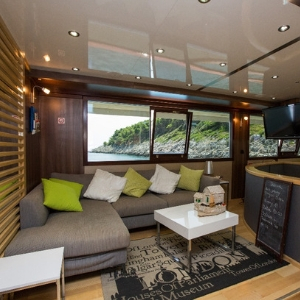 The standard lower deck cabins have portholes, whilst windows offer sea views from the upper and main deck cabins. 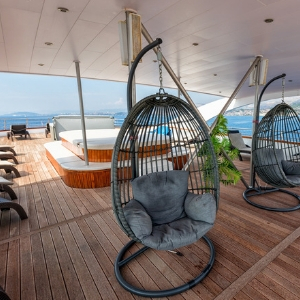 On board facilities ensure that every guest enjoys maximum options for relaxation and socialising. During the day, the partially shaded sun deck offers a prime spot to soak up the sunshine and admire the ocean views. Take a refreshing dip in the plunge pool or access the sea via the ladders on the swimming platform, located at the ship’s rear. The elegant bar and outdoor terrace provides an idyllic place to spend an afternoon. Buffet breakfast and half-board meals are served to all guests in a single sitting in the spacious air-conditioned salon-restaurant.